AirTouch from Polyaire is a smart air conditioning controller that enables energy savings in the home through Smart Energy Management of climate control systems. The following 5 Smart Energy Management features in the AirTouch controller not only save energy in your home through smart operation of the air conditioning systems but also simplify and enhance your life. 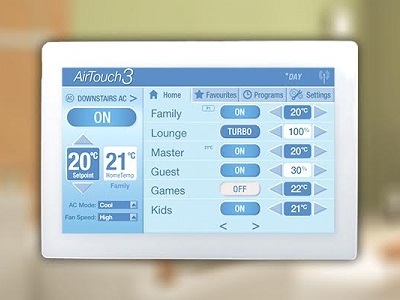 Using AirTouch, you can run the air conditioner in the rooms that you are using, making everyone more comfortable wherever they are in your house faster, without wasting energy in the rooms not in use. AirTouch’s ITC sensors actively monitor temperatures in every room of your house, so that the system sends conditioned air only to the rooms where it is needed, not only saving energy but also responding to each room’s changing temperatures because of the weather or occupancy. You can also tailor the temperature in each room to the occupant’s personal comfort levels. The AirTouch app allows you to manage your climate control system remotely. You can make sure the air conditioner isn’t kept running all day when you aren’t home; turn on and off or change the settings on your system from anywhere outside the home; make sure your pets are comfortable at home when you’re not around; or even activate the parental lock to prevent your kids from playing with the air conditioning system. Monitor and stay on top of matters at home by receiving alerts to temperature changes when you are away. You can also turn on the air conditioning, especially in summer, to keep the house cool when you return. AirTouch helps you track your air conditioning use and keeps you informed so you know you are not wasting energy.